Spring – planting season – isn’t a good time to read David R. Montgomery’s Growing a Revolution (W.W. Norton & Co., New York, 2017). Not when you live, as I do, in farming country in upstate New York. The plows are at work everywhere, from large green motorized behemoths to the horse-drawn antiques of the Amish. And, according to Montgomery, this is what not only has been destroying farmland around the world, it also probably was responsible for destroying past civilizations. Montgomery sounded a death-knell over a decade ago in his book Dirt, which took a wide-eyed trip through a history of soil erosion and nutrient eradication, the long-range after-effects of what we thought too easily was progressive agriculture. It stands alongside Bill McKibben’s The End of Nature as a call for action falling largely on deaf ears, so Montgomery has revisited the topic in an encouraging, inspiring way. The needed changes can be made, he argues, and are being made – and in the unlikeliest places. 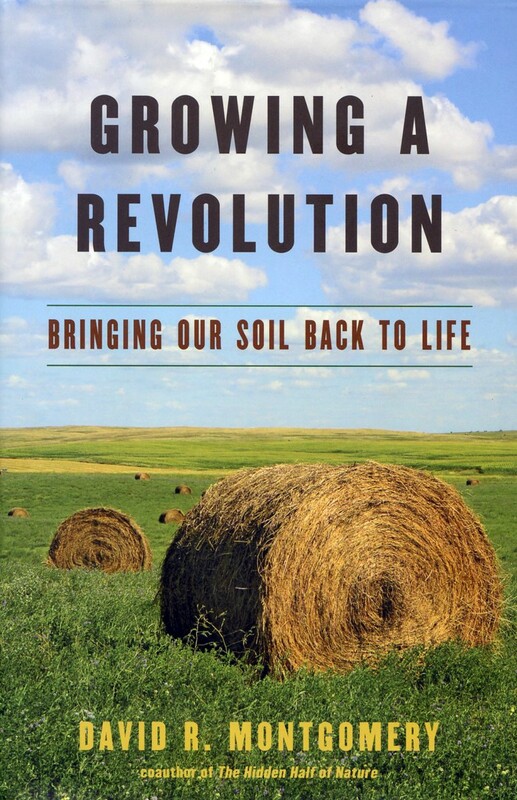 Growing a Revolution follows the author from country to country, climate to climate, to look at successful examples of no-till farming. As Montgomery is quick to observe, farmers generally aren’t given to change anything unless confronted with evidence of success, and that success needs to be seen in the harvests. The key to Montgomery’s argument is conservation agriculture, the three components of which are (1) minimum disturbance of the soil; (2) growing cover crops and retaining crop residue so that soil is always covered; and (3) use of diverse crop rotations. These principles can be applied anywhere, on organic or conventional farms, with or without genetically modified crops. The invention of the plow gave us cheap, reliable weed suppression, even as it destroyed the teeming world of earthworms and fungi and micronutrients that keep soil viable. Plant roots, Montgomery explains, are two-way streets through which carefully negotiated and orchestrated exchanges occur. Plants absorb nitrates and other soluble nutrients, and release carbon-rich molecules to feed fungi and bacteria that draw nutrients from the soil. You can learn much more about this from Montgomery’s previous book, The Hidden Half of Nature, co-authored with his wife, Anne Biklé, and reviewed here. The large-scale manufacture of fertilizer worsened the problem, creating a dependency cycle that keeps those factories humming – and the dark secret behind them is that those factories can quickly be converted to munitions production, which ensures that they get federal financial support. Thus have we degraded a third of the world’s agricultural land – and it’s a failure that resonates through history. Examining the archaeological record for ancient Rome, it’s clear that after the conquest of Carthage, when slave labor became plentiful, the landscape changed from small family farms to huge plantations, with the result of tremendous soil erosion and the eventual collapse of a civilization. There was massive soil erosion in colonial America thanks to tobacco farming, but that was at a time when there seemed to be no end of fresh land. It turns out, argues Montgomery, that there is an end. Thus the simple, straightforward message of his conversational, well-crafted book, backed by centuries of common-sense farming. But we’re dealing with decades of quick-fix evangelizing, which keeps the chemical-fertilizer and herbicide makers wealthy, and the aforementioned class of stubborn individualists, whose plows large and small are in gear at the start of the 2018 growing season. So Montgomery takes us on a tour of farms where no-till techniques have been proven. We meet third-generation no-till farmer Guy Swanson in a Kansas workshop, who notes that companies that control the fertilizer industry are functional monopolies. In the United States … Koch Fertilizer dominates production of nitrogen fertilizers, and the Mosaic Company (a spinoff of Cargill) is the largest producer of phosphate and potash fertilizers. He also focuses attention on Monsanto, makers of Roundup (glyphosphate), which has a monopoly on patented seeds for glyphosphate-resistant crops. Writing about Swanson, Montgomery observes, On an irrigated no-till farm with a corn-corn-wheat-corn-sunflower rotation, his system reduced a $200-per-acre conventional fertilizer bill to less that $100 an acre. And it saved $25 to $60 an acre on dryland fields planted half in wheat and half in corn. 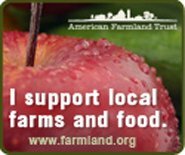 If applied to a 10,000-acre farm, this adds up to an annual net savings of more than a quarter-million dollars a year. These are the dollars-and-cents figures farmers need in order to be persuaded, and they’re here in the book, calculated at each of Montgomery’s stops. Wes Jackson founded the Land Institute in 1976, and is a celebrity pioneer of the sustainable agriculture movement. What he’d like to see on the prairies is an herbaceous polyculture founded on perennial grains instead of animals, in a bid to fight perennial erosion. After years of development, he’s now marketing one such grain called Kernza, which eventually should have a yield on a par with annual wheat. A visit to Dwayne Beck, director of Dakota Lakes Research Farm near Pierre, South Dakota, looks at crop rotation. There’s no single best way, according to Beck – you have to develop your own based on location. His advice: Water use must match water availability. Crop diversity and ground cover are necessary for fending off weeds, pests, and disease. Crop rotations must not be consistent in either interval or sequence. Jerome Rodale created Organic Gardening and Farming magazine in 1942, offering information about what he’d already put into practice at his Pennsylvania farm. His son Robert now runs the Rodale publishing empire and the 333-acre Rodale Institute, where they practice what they preach. 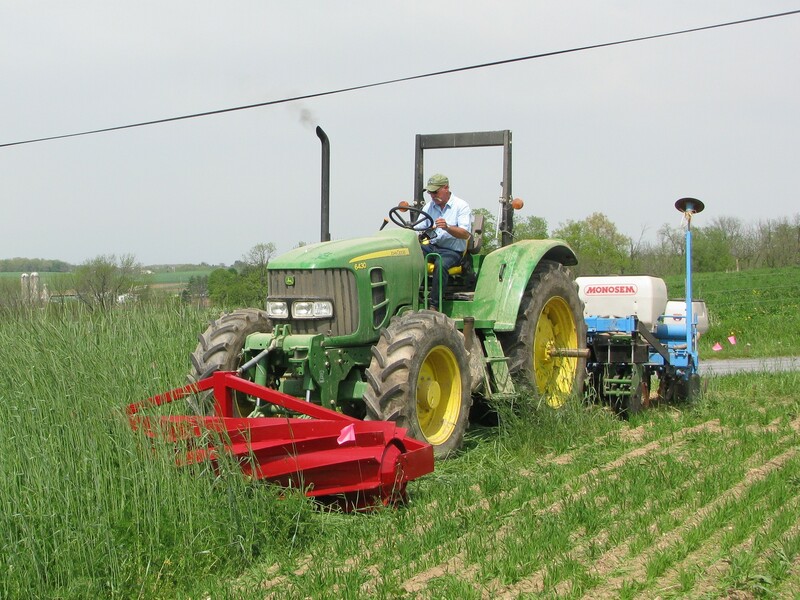 Farm manager Jeff Moyer identifies weeds as the biggest problem, and uses a roller-crimper to crush the cover crop and thus block weed growth. Used with a planter, it allows the farmer to drop seeds into fresh mulch. Because of the persistence of perennial weeds, Moyer tills about every third year, terming it rotational tillage. The US Department of Agriculture and a handful of universities saw the Rodale results and set up their own organic test farms. A 2015 review … found that organic practices proved economically viable (comparably or more profitable) and resulted in improved soil quality, greater soil carbon capture, and better pest suppression. But, as Moyer observes, farmers aren’t converting to organic methods because of the perceived protection of crop insurance. Montgomery’s world tour included a visit with Rattan Lal, a native of Punjab who earned his Ph.D. at Ohio State University in 1965 at the age of 24. After conducting successful experiments at the University of Sydney, Lal was hired by Nigeria’s International Institute of Tropical Agriculture, where he introduced no-till farming. Although the board chairman called it madness, within five years, Lal was vindicated by success. Herbert Bartz experimented with reduced tillage in southern Brazil in 1970s, and kicked off what became a conservation agriculture movement in South America – which now is approaching total no-till in Argentina and southern Brazil. Ironically, it was helped by Monsanto’s Roundup for weed control, although many farmers are now adopting the other two conservation agriculture principles. In Ghana, Kofi Boa runs the No-Till Center, where he’s known as Mr. Mulch for the cover crops he grows – green manure, he calls it. He’s fighting a history of studies in Africa that don’t see no-till as an effective solution – but the studies are flawed insofar as they don’t reflect all three components of conservation agriculture. In Costa Rica, Montgomery meets coffee farmers using biochar, a charcoal produced in smoldering fires, as a soil amendment. Inert but highly porous, it’s excellent for holding water and providing a microbial habitat. Peter Kring, an expatriate American who has lived in Costa Rica for many years, turned an abandoned cacao farm into a thriving one, with additional fruits and spices. Also at issue is the matter of returning organic matter from cities to farms, which merits its own chapter. Milwaukee has been selling biosolids to farmers for a century; Denmark recycles more than half its sewage sludge, while Canada is recycling a fifth and the U.K. twice that amount. Montgomery visits a Tacoma sewage treatment plant visit that produces TAGRO, a microbially digested fertilizer, mixing biosolids, sawdust, and sand. Controversy bubbles over what’s in such biosolids and how it’s applied, especially regarding heavy metal and pathogen content. Montgomery is fairly dismissive of the contamination potential, but he seems to be guided by a pair of reports that asserted low risk potential – although the studies themselves aren’t summarized. This issue hit home recently, as my hometown of Glen (Montgomery County) in upstate New York, recently was approached by Canada-based biosolids company Lystek to install a treatment facility in a nearby industrial park. This led to a very vocal outcry from some residents, a huge hearts-and-minds campaign by Lystek, and, ultimately, a rejection on the basis of legal technicalities. Much of the information in Growing a Revolution grows repetitious – don’t till, plant cover crops, rotate, repeat – but Montgomery clearly is aware of this, and thus dresses his chapters with good humor and diverting anecdotes. I can’t see how he otherwise could write so persuasively about the subject. At this point, only about 11 percent of global cropland is under conservation agriculture. Three-fourths of that is in the Americas. Very little of it is in Europe, Asia, and Africa. The revolution is coming more and more to the mainstream, as in a New York Times Magazine piece titled Can Dirt Save the Earth? (4/18/18) by Moises Velasquez-Manoff, and covers much of this ground. But it needs to spread to the fields, until the day we can all celebrate spring with the sight of lush, arable, unplowed fields.